One of my goals for this year is to take some me-time on weekends, and just relax. Step away from the Internet and the computer and the ... everything else that seems like work. I was hoping to read a book every weekend, but Scratched by J.J. Partridge took me a little longer than one weekend. Not because I was slacking off on my relaxing. And not because it's an overly-long or difficult book. Possibly because there was so much going on, that I needed to really pay attention. And sometimes go back a few pages to make sure I followed all of the threads correctly. 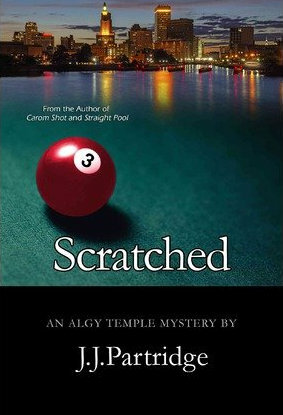 This is the first J.J. Partridge book I've read, but apparently this author likes writing mysteries involving pool. Earlier books are Carom Shot and Straight Pool. The book starts with a murder. Or I guess, more accurately, it's the discovery of the dead body. From there, several threads emerge. The whodunnit about the murder is primary. But there's also a pool tournament that's the biggest thing in the city, a conflict over Columbus Day, and a financial scandal. Meanwhile, the main character, Algy Temple, is preparing for his wedding. At first, all the threads seem separate, but then things begin to intertwine in interesting ways. And then it's all one well-woven story. One of the best things about this book was that although the ending made complete sense, I didn't see it coming. There's nothing worse than knowing the ending before the characters do.